The first-ever image of a black hole, captured from more than 55 million light years away in galaxy Messier 87, did more than open a new era of astrophysics. It unleashed a flurry of memes across the Web. From speculations of what the black hole looks like (an intergalactic bagel? The Eye of Sauron?) to congratulatory memes recognizing Kate Bouman, the scientist who developed the algorithm that made it possible to stitch together data from multiple telescopes to create an image of the black hole. Bouman, an assistant professor of computing and mathematical sciences at Caltech, worked with MIT’s Computer Science and Artificial Intelligence Laboratory, the MIT Haystack Observatory, the Harvard-Smithsonian Center for Astrophysics and a team of researchers to develop the algorithm, three years ago. She had the joy of seeing her work come to fruition April 10, 2019 – and her reaction instantly captured in a tweet that went viral. The Event Horizon Telescope, actually eight synchronized telescopes spread across the world at high-altitude sites, captured the images. The recorded data, collected in 2017, was stored on helium-filled hard drives, then flown to supercomputers at the Max Planck Institute for Radio Astronomy and MIT Haystack Observatory. 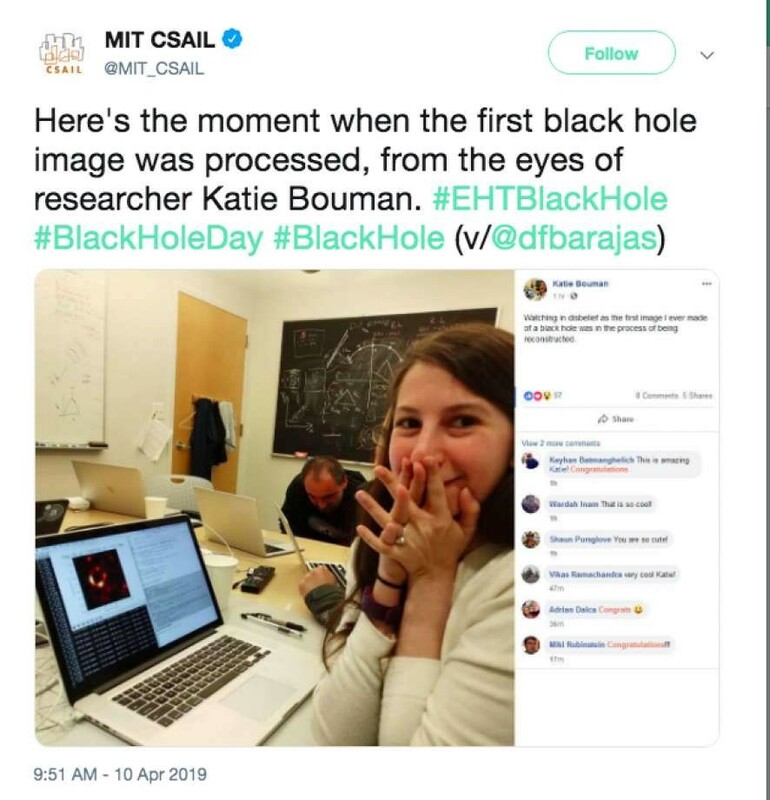 That’s when Bouman and her team’s work came to fruition, combining the data and converting it into the first-ever image of a black hole and its shadow. M87, the 40 billion kilometer black hole with a massive shadow that appears in the photo as a fiery ring, looks just as scientists theorized a black hole would look. More significantly, its presence in the universe helps verify Albert Einstein’s general theory of relativity. The existence of a black hole and the way space-time is warped by its extreme mass is a tremendous first step in understanding many of the mysteries of the Universe. In the meantime, we’ll walk around sharing memes and humming Soundgarden’s Black Hole Sun.